March Photo Blogging Challenge: Three! 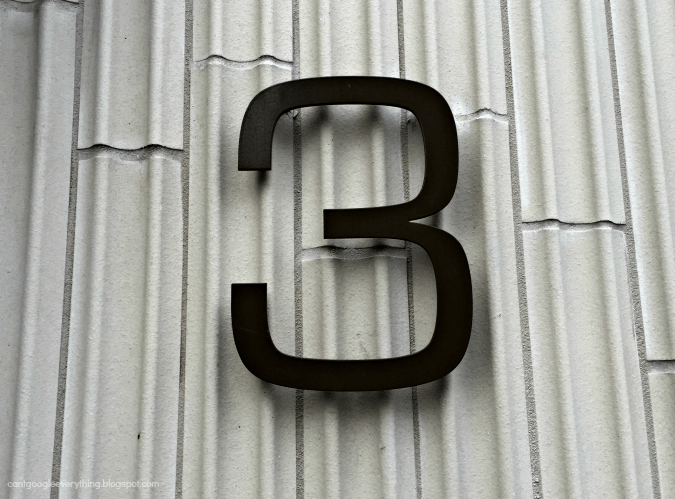 This is the third year anniversary of the Photo Blogging Challenge, so it seems only appropriate that this month’s theme is “three!” I am linking up again this month with P.J. for this challenge and I have set a goal for myself to keep doing this challenge every month. I really enjoyed this months theme because it got my to really look around and find things to take photos of deliberately, rather than just using snapshots I had taken throughout the month. Here are my five photos for this month! My intention was to take photos of things with the actual number three on them. So, this was my first photo, which is an address of a house on my street (not mine!). I cropped it close, but that’s all for editing. It’s almost looks black and white, but the number is actually a very dark brown in real life! I love this photo because I love photos of storefronts. I especially enjoy the clothes set up in the window, balanced by the random plants from the house next door! I had a little bit of fun editing this photo, but I just think transportation photos look better in black and white, don’t you? Then I discovered I could highlight colors in certain areas so I decided to highlight the number 3 on the tram, to go with the theme and really make that “3” stand out! 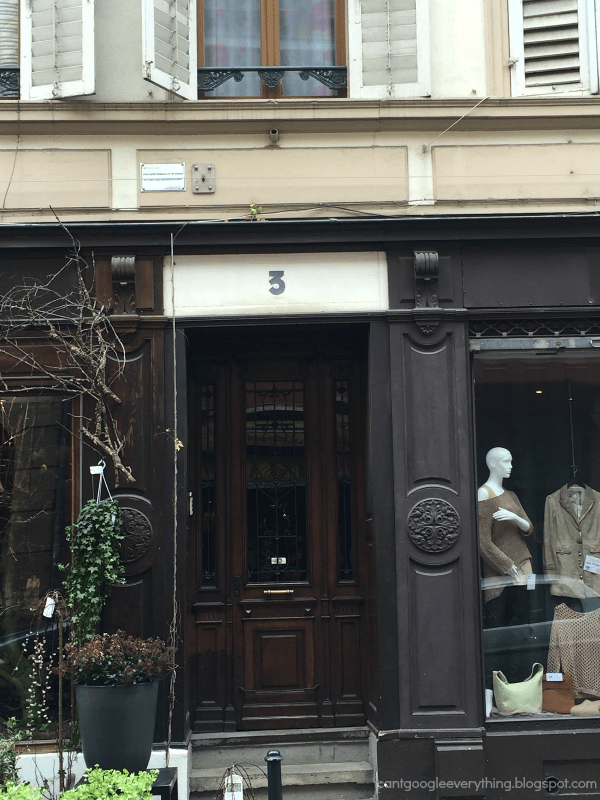 This is another shopfront in Mulhouse, although not as “cutesy” but I loved the name of the shop and decided to use it for the theme of the month! A lot of people walked by when I took this photo and all of them probably thought I was a crazy person for taking a photo of a clothing store sign, but I found out that I really didn’t care! 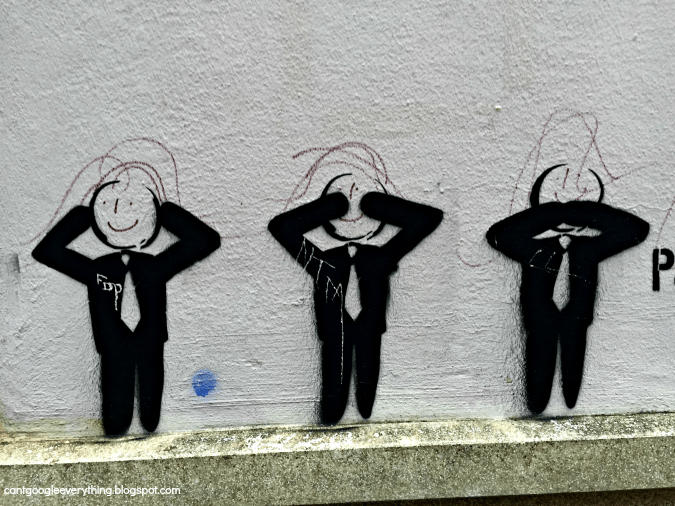 I saw these little graffiti guys out of the corner of my eye down an alley and I knew I just had to take their photo! I made my husband wait up while I took the picture. Three regular guys doing nothing evil! And those are my five picks for this months theme! If you want to join the Photo Blogging Challenge check it out over on PJ’s blog! Did you enjoy this post? I’d love to have you sign up for my newsletter! Yes, transportation photos do look good in black and white. Keeping the color of the 3 was a nice touch. I like your take on the theme. Using "3" in it works well. I think the tram photo is my favorite though. I love photos like that. Nicely done! The sign in French was worth taking a photo of. I love all your shots for this months theme 3 and yes your transport photos look great in B&W. The little bit of colour in the tram image really highlights the '3' mwhich is justperfect for the theme. The shop doorway looks quirky and interesting. See, that's what I was going for, but my threes were boring so I changed directions. Thanks for showing me that it was a good idea! These are so professional and polished. I think the third is my favorite. Your photos are very creative! You really took the challenge to heart and photographed with purpose. 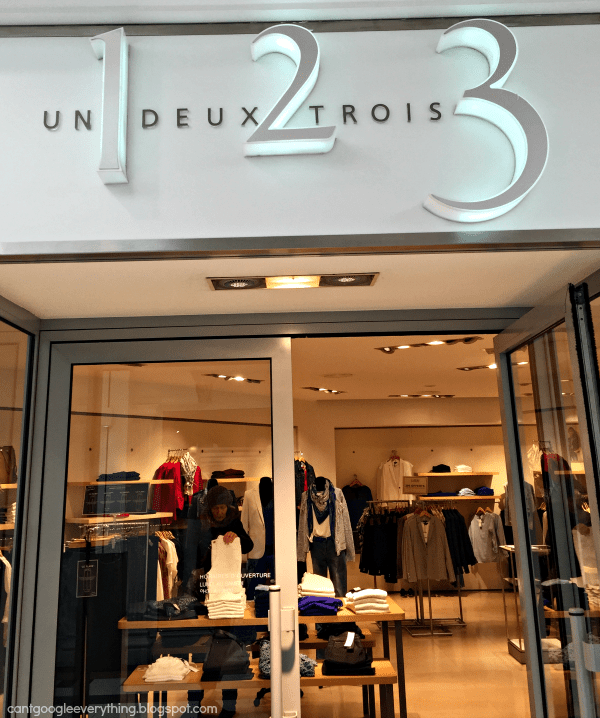 Un, deux, trois…c'est manifique! The graffiti pic with the three monkeys has so much character; it's my favourite of the lot. Love your take on the theme for Three. It really took a good eye to watch for the number 3 to appear. And I love the three graffiti guys!